Cruise and Passenger Services is the only valet parking service recommended by P&O Cruises and the only available service inside the Southampton port estate. 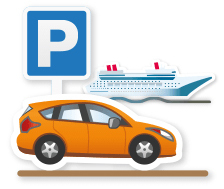 If you are eligible for complimentary car parking and this has been confirmed by P&O Cruises at time of booking, you must confirm reservation of your parking space with no later than 35 days prior to departure. Please note that Cruise and Passenger Services do not offer complimentary parking for those who have a disabled badge in their car and there are no such facilities offered at each of the terminals in Southampton. Once booked, you will be sent a confirmation pack with all the details and a parking sticker for your car. If you are eligible for complimentary airport car parking and this has been confirmed by P&O Cruises at time of booking, we recommend that you call APH on 0844 871 7561, 72 hours after making your cruise booking for car parking at your preferred airport. Upon arrival at the correct terminal in Southampton, you will be directed into a drop off lane where you can unload your luggage (porters are available to assist). Your car is then checked-in and the keys left with Cruise and Passenger Services. You can then proceed to check-in whilst the car is driven by a specialist driver to a long stay car park where it will remain until the day you return. All car parks used are secure and are regularly patrolled both day and night. Upon return, once you have reclaimed your luggage and passed through customs you should make your way to the car park where you are able to collect your keys and will then be directed to your car. To arrange your complimentary car parking in Southampton please call Cruise and Passenger Services (CPS) on 0345 071 3939 no later than 35 days prior to departure. Please note you can secure your space 72 hours after you have booked your cruise holiday.